I’ve seen people planning for this day from months in advance; preparing the guest list with utmost care, making sure to get the most enviable gifts for yourself, never missing even a single occasion to display your undying love for each other, etc etc etc. As much as I’d have liked to go by the conventional way of celebrating my 4th wedding anniversary, it was not bound to happen, and I was glad for it. I’m not exactly the anti-social type, but these so-called social-dos seem like work to me. They’re fun for A Jr, but definitely not for me. I prefer being in the company of loved ones and sharing a quiet cozy evening together. But what took place was even better than my imagination. We had two of my very dear and very fun-to-be-with brothers-in-law for company this time round. One of them’s getting hitched next month and they were here for the whole wedding shopping thing (A dedicated wedding shopping post coming up very soon for you).Anyway, the day started with heavy showers and a visibly sick A Jr. Poor thing, he was down with cough, cold and some viral infection. Bunked his school and stayed home while the BIL’s went for shopping alone and A joined them later. Chautha jaane ko hai, sach mein kya hum yahan the? Khamosh se tum aate hue kal ko dekhte the. Mera bachpana samajhkar use bhool jaathe the. Apne chiraag se gar mera jahan roshan na karte the. Belated Happy Anniversary to both of you :)What a delightful celebration of love :)That cake is so tempting 😀 :DWishing you both life's best and loads of love and cheer!! 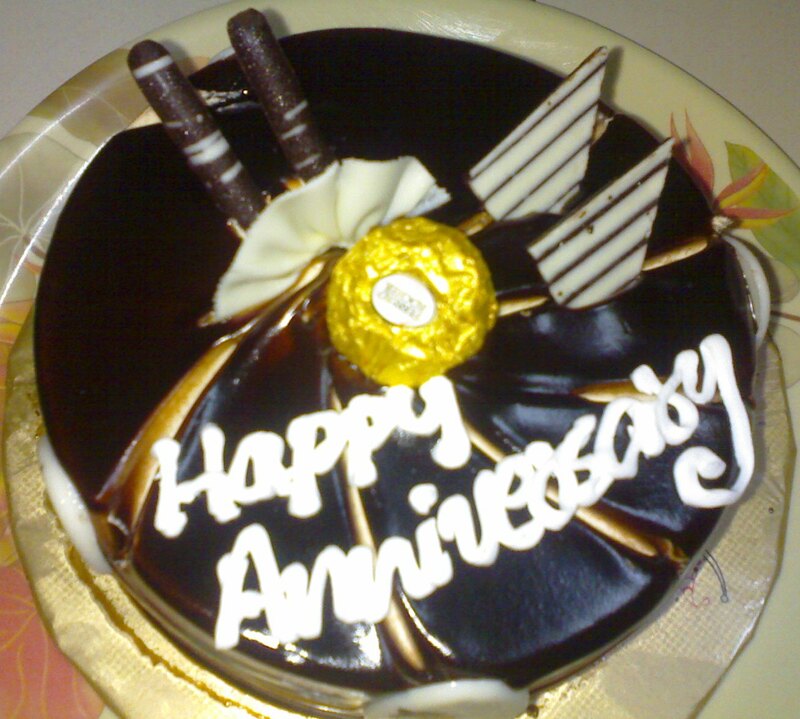 Awwww…a very very happy anniversary to you Varsh. Wish you both a lot of happiness and togetherness in the years to come. Aww..super poem that is…all the true feelings poured in words 🙂 I'm sure A loveeeeed it !I'm sure the cosy celebration is much much better than only-temporarily-smiling guests…I'm the same..I like my own celebrations with the immediate family :)Wishing you and A once again Varsh ! Happpyyyyy Anniversary…..dear u have written wonderful poemi can imagine how glad A would be !! @Nu: Thanks Nu sweetheart…from both of us! :)A loooooooooved the poem…no doubt about that…it was out of the blue and he was quite a sight with that surprised look :PI hte noisy gatherings too….why not let it be a low-key affair and involve only those people who're genuinely interested, right?? Many happy returns of the day Varsha! the poem was lovely. No wonder A was thrilled! :DHope A Jr. is better now. Monsoon does bring on the sniffles. Take care! Can't i subscribe through email Varsh? Belated Happy Anniversary :)Sheesh! Haven't been very active on fb…missed it there too . The cake looks absolutely heavenly! The poem is beautiful Varsha…I read the 1st para to chk out if I recognised any words there but read the remaining with rapt interest. It was easy to follow and very meaningful. Please accept my belated wishes:-))!!! !